ZixAuditor® is an assessment service that enables organizations to identify email security vulnerabilities and implement more effective policies and procedures to achieve higher levels of protection. ZixAuditor is designed to help companies manage risk associated with standard of care practices. It also provides strategic insight into an organization's email usage and the vulnerabilities associated with such usage. For example, ZixAuditor provides accurate information on the type and quantity of inbound and outbound electronic mail that contains sensitive or proprietary information. ZixAuditor features a comprehensive set of filtering lexicons, along with a complete set of labels and masks to identify sensitive types of information. ZixAuditor has built-in support for HIPAA and other industry practice and regulative standards, including benchmarking tools from which to measure compliance. The product operates securely and discreetly. And it works with no impact on network performance. For searching of full-text email messages, including headers, text, and all attachments, ZixCorp™ chose to embed the dtSearch Text Retrieval Engine. "The software has an impressive feature set and covered everything we needed for an email content scanner," said Eddy Smith, Research Engineer, ZixResearch Center, ZixCorp. "We liked the many search options that dtSearch provided, including forensic indexing, word stemming and matching on Boolean, numeric, wildcard and proximity expressions." 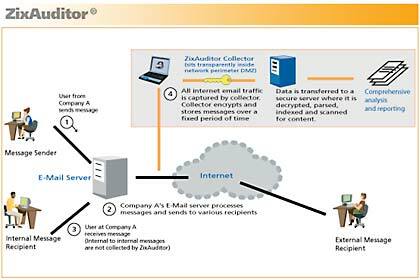 ZixAuditor is part of ZixCorp's security suite, enabling organizations to leverage email as a mission-critical application that can be used efficiently and security for even the most sensitive electronic messages and content. As a global provider of secure e-messaging services, ZixCorp providing innovative, cost-effective, and easy-to-deploy solutions that ensure the highest level of security for corporate email and other electronic messages.